Ever been to a punk rock show in the 70s? It could be an all-out war! Heads would be banging, mosh pits would be raging, and it wasn’t uncommon for a barstool or two to be thrown. Of course, the fashion of the scene followed that harsh landscape. That meant mohawks, thick chunky boots, spiked collars, and plenty of black leather. The scene might not be as prevalent today, but the fashion still lives on as a statement! It represents the rebellious nature of those would stand against unjust authority! 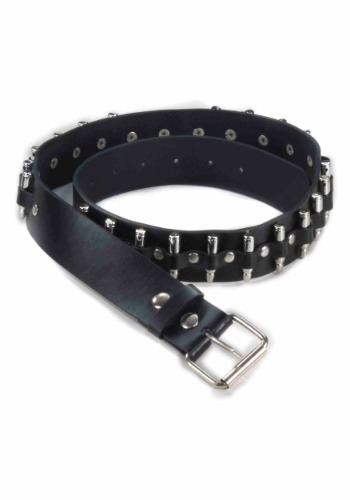 You can add a little bit of punk rock style to your look with this silver bullet belt accessory. This belt measures just over 42 inches long and is made out of a faux leather material. It features metal, faux bullets attached to the sides with loops and rivets. The belt is fully adjustable, so it’s a one size fits most fit. Wear it with a pair of boots, spike your hair, and then you’re all ready to head out to listen to some of The Ramones. If you’re suiting up to head to punk show, or if you’re trying to pay homage to your favorite punk rocker, this belt is great for you.